I arrived to line up for the Yoder Heritage Days Festival parade over an hour early. I was kindly pointed to my spot in line – a line that stretched miles down a straight, flat Kansas highway. I began my day strolling among the soon-to-be parade entries and festival participants, and I found the best Kansas has to offer: Friendly, resourceful locals, breathtaking beauty and a sense of humor. 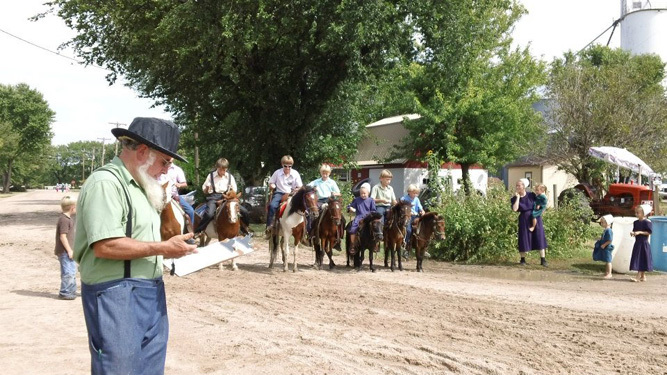 As a first-time visitor, it was impossible not to wonder about the Amish and the Mennonites who live in Yoder, what it means to live a lifestyle most would consider especially old-fashioned, and why the “then” and “now” appear remarkably similar. According to a question and answer forum written by John and Brenda Weaver, the Mennonites and Amish immigrated to America in the 1700s to enjoy religious freedoms. Although they share roots and some fundamental beliefs, Mennonites and Amish vary in the degree to which they assimilate into modern culture. Some of the most conservative groups choose to drive horse and buggies, wear modest clothing and shun the use of many modern technologies - including electricity. Other groups, predominantly Mennonite, are integrated into modern society and are impossible to distinguish. Spending time in Yoder is like looking into a beautiful, colorful time capsule. After the parade, I watched buggy races and draft horse events and ate homemade chicken noodle soup. I wandered around the hardware store looking at the unfamiliar green bean frenchers, oil lamps and berry screens. Main Street was lined with families in simple clothing: Women and their daughters often in dresses cut from the same cloth, men with closely trimmed beards, button-style shirts and flat straw hats. It was easy to slip away and forget the phone in my pocket competing for my attention. At one point in the afternoon, children gathered with their ponies to perform a series of races, games and tests of skill. One little girl, probably aged seven or eight, was fearless. Her dark purple dress flew behind her as she encouraged her horse around the barrels. The afternoon was photo perfect, and I found myself snapping shots of Amish families in spectator stands as well as the fearless young horsewoman. Although I wasn’t alone in taking pictures, it felt uncomfortable, intrusive. I asked an Amish woman beside me how families felt about having their pictures taken and, quite possibly, published online. The older woman laughed, and said she didn’t suppose it was any different than being in the newspaper.My trip to Yoder proved to be a wonderful intermingling of the “then” and “now.” While people like me can’t resist capturing images of buggies and bonnets and posting updates to friends at home, the Amish people of Yoder remain quietly committed to their faith, reflected through their humble lifestyles.